HARARE (AFP) – Zimbabwe’s military was in control of the country on Wednesday (Nov 15) as President Robert Mugabe said he was under house arrest and his generals denied staging a coup. Mugabe’s decades-long grip on power appeared to be slipping as armoured military vehicles blockaded parliament, soldiers took up positions at strategic points across Harare and senior soldiers commandeered state television to broadcast a late-night address. “The President... and his family are safe and sound and their security is guaranteed,” Major-General Sibusiso Moyo said. Their shock announcement was later followed by heavy gunfire close to the 93-year-old President’s private residence, and prompted angry responses from around the world. Mugabe later told South African President Jacob Zuma that he was effectively under house arrest – though unharmed. Several supporters of Mugabe and his wife Grace are reportedly in military custody. Pretoria said it would deploy a military and intelligence delegation to Harare to help broker a resolution to the crisis on behalf of southern Africa’s regional bloc. The Southern Africa Development Community said it would hold an emergency meeting in Botswana on Thursday to discuss the situation. South Africa, the European Union, the United Nations and Britain, Zimbabwe’s former colonial master, all called for restraint. Britain’s foreign minister Boris Johnson warned against handing power “from one unelected tyrant to the next”. Zimbabwe’s army was set on a collision course with Mugabe last week when the ailing leader abruptly fired his vice-president Emmerson Mnangagwa, a lynchpin of the country’s defence and security establishment. Mnangagwa, 75, was previously one of Mugabe’s most loyal lieutenants, having worked alongside him for decades, but he fled to South Africa following his dismissal and published a scathing five-page rebuke of Mugabe’s leadership and Grace’s political ambition. Army chief Constantino Chiwenga gave an unprecedented press conference on Monday, flanked by dozens of officers, and warned Mugabe that he would intervene if he continued to purge the ruling Zanu-PF party of leaders like Mnangagwa. Mnangagwa has been embroiled in a long-running feud with Mugabe’s wife Grace, 52, that included a bizarre alleged ice-cream poisoning incident that laid bare the pair’s rivalry. Both were seen as leading contenders to replace Mugabe when he died or retired, but Mnangagwa had the tacit support of the armed forces which viewed Grace – a political novice – with derision. The Zanu-PF party on Tuesday accused Chiwenga of “treasonable conduct” for appearing to threaten Mugabe with a palace coup. Speculation has been rife in Harare that Mugabe had sought to remove Chiwenga, seen as an ally of Mnangagwa’s. The African Union, in a strongly worded statement, said the crisis “seems like a coup” and called on the military to pull back and respect the constitution. The military’s actions pose an existential threat to Mugabe’s regime which has ruled Zimbabwe since independence from Britain in 1980. On Wednesday, state television played liberation struggle songs, while many citizens in Harare shopped at markets, drove to work or queued outside banks despite the turmoil. “We want to have food on the table, not one side having everything and others dying of hunger. Mugabe was once a good person but he lost it. Now we need a fresh start,” Keresenzia Moyo, a 65-year-old housewife, told AFP in Harare. “What is good is that this has happened at the top and it is not affecting us people on the ground. People could be killing each other,” she said. Foreign embassies in Harare have told their citizens in the country to stay in doors and avoid political gatherings, warning that security forces could clamp down violently. Security officers at Harare airport deported several foreign journalists as they arrived in the country to report on the situation. Mugabe and his wife have made no public comment and their exact whereabouts are unknown, while government and army spokesmen have been unreachable. 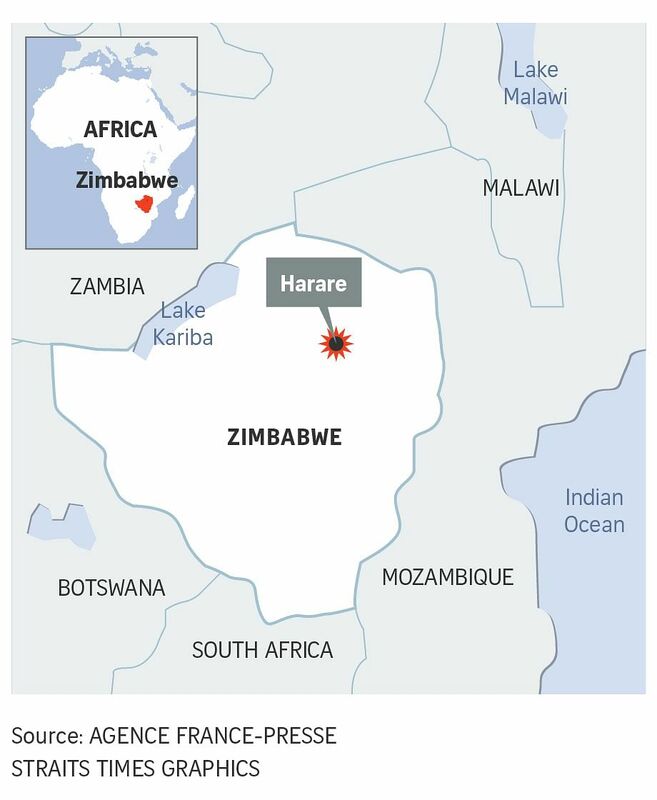 “The government’s silence on the military deployments seem to confirm that President Mugabe has lost control of the situation,” said Robert Besseling of the London-based EXX Africa risk consultancy. Mugabe is the world’s oldest head of state, but his poor health and listless public performances fuelled the bitter succession battle between Grace and Mnangagwa. His lengthy rule has been defined by brutal repression of dissent, mass emigration, vote-rigging and financial ruin since land reforms in 2000. As the economy began to fail in the wake of the botched land redistribution, Zimbabwe was engulfed by hyperinflation and was forced to abandon its own currency in 2009 in favour of the US dollar. Unemployment now stands at more than 90 per cent. Before the military’s shock intervention, Mugabe had declared his intention to contest presidential polls scheduled for next year. Grace Mugabe vocally pushed for her husband to stand as she became increasingly active in public life in what many see as a process to help her eventually take the top job. “I think the army are in negotiations with Mugabe and Mnangagwa,” Derek Matyszak, an analyst at the Pretoria-based Institute for Security Studies, told AFP. “ Mugabe reappoints Mnangagwa as vice-president, briefly – Mugabe then retires,” he speculated.